Want to instill the travel bug in your littles? Need some literary inspiration for imminent Summer road trips? 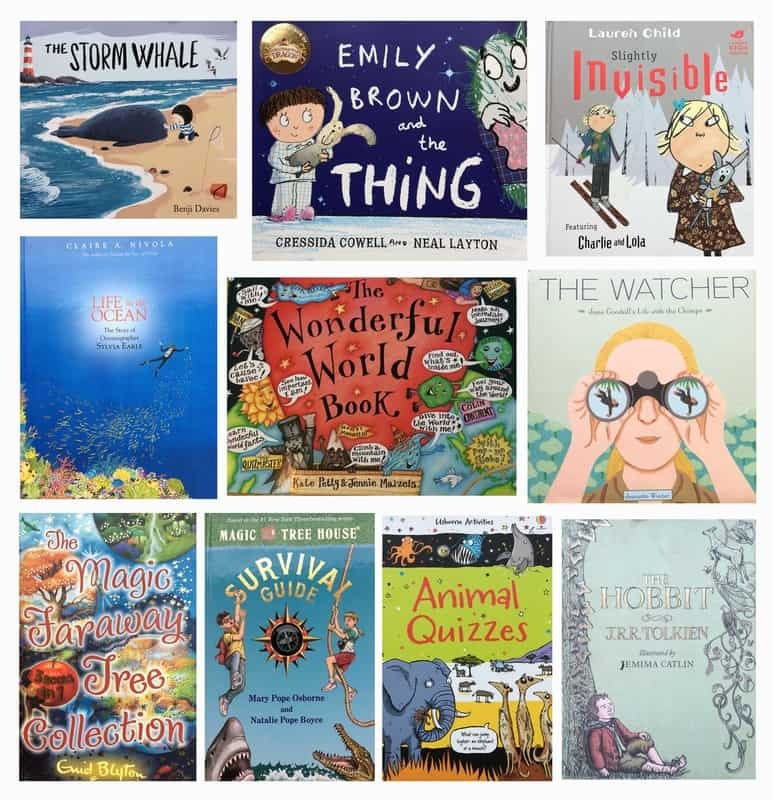 Here are our firm family favourites – books to connect your kids to nature and amped with the adventure spirit. We love Charlie & Lola in our household but this one is absolutely our favorite! Packed with imaginative adventures, it’s an easy read with wonderful illustrations. I remember my rapt attention in primary school when my teacher read us The Faraway Tree. It could well have been the start of my love affair with books. So I was overjoyed when my eldest came home from school, age 4, and told me they were listening to it at school. Both of my girls still love it when I read The Faraway Tree at bedtime and I cherish the nostalgic feeling reading it out loud – a shared love between me & my children for fantasy – words that conjure a make believe wonderful world in which we can lose ourselves. I’ve also overheard my eldest reading it to my youngest. A timeless classic by Enid Blyton telling the adventures of the inhabitants of the Faraway Tree to the mysterious lands at the top of the tree. Best line: “My goodness, what an adventure! I vote we don’t come up here again”. But as you may guess, they did! Beautifully illustrated, this picture book tells the life story of Jane Goodall, the iconic conservationist. Set in England little Jane avidly watches wildlife in her garden & develops a true love of nature. The story continues with Jane growing up and working as a waitress to save up for her dream – a ticket to Africa! This books shows every child it’s possible to become whoever you dream to be, and I love that it shows a great work ethic too – saving up hard for what you want to do. This book has had an immense affect on both my girls (age 5 & 7) and provoked the beginning of a love of bird watching in our family & a request for binoculars for Christmas! A gentle, heart-warming picture book about a young boy who rescues a beached baby whale. The underlying tender message of loneliness & love is captured perfectly for children. We also love trying to find Noi’s six cats throughout the story! To say we love this book is an understatement. A pick up buy on a ferry journey, this book has continually served us with hours of entertainment on road journeys. A book crammed with over 500 multiple-choice questions on animals, this read is a must for children age 6+. Factual questions blended with current literary or legendary beastie questions keep this book interesting and a hit with the whole family. Perfect for young adventurers requiring essential reading for how to survive a lion/bear/shark encounter, a twister/stampede/flood/extreme heat/cold. Gives accurate advice on how to deal with the above situations as well as general wilderness practicalities such as getting lost, reading a compass, build a campfire and how to survive a fall. Easy to read, this book guarantees glued readers from age 6+. Highly recommended! This picture book was such a staunch library favourite when my youngest was 3, that I went out and bought it. A wonderful tale about Emily Brown and her rabbit Stanley who discover a rather upset ‘Thing’ who seems set on keeping them awake all night.Emily Brown and Stanley go on numerous dangerous missions to solve ‘the Thing’s’ problems. Great twist at the end. Best line: “What are you scared OF?” “Oh …… I don’t know. Things ….” said the Thing. I grabbed this book as soon as I spotted it in our school’s second hand sale. An interactive pop up book, it details facts and figures of every description about our World. Slide mini action figures on a windsurfer down the longest river in the World, or ski a mini action figure down the highest mountain. Boasting world records and showing how Space, Oceans, Continents, Time Zones and Natural Disasters work through dials, flaps and pop ups. Brilliant, engaging and fun. After travelling New Zealand as a family and visiting the set of Hobbiton, Father Christmas kindly gave my eldest a copy of the great modern classic, The Hobbit. Perfect for bedtime reading together, Tolkien, transports us to the magical adventures of Elves, Hobbits, Dwarves and Dragons, and allows us to relish reading as a family. Reluctant to leave his safe, comforting home behind, Bilbo Baggins demonstrates fantastic bravery and courage, surprising even himself. A wonderful tale of friendship, love and adventure. Every birthday I choose an inspiring book from the ‘A Mighty Girl’ website recommended book list. Life in the Ocean is the story of Sylvia growing up as a young child as her journey to become a world-renowed oceanographer and environmentalist. Again stunning simple illustrations marry beautifully with easy to read text guaranteed to inspire any young reader. If you are raising girls, do check out the A Mighty Girl website. Their tag line sums it up perfectly – the world’s largest collection of books, toys and movies for smart, confident, and courageous girls. A fantastic resource for Mothers keen to encourage young girls to become what they dream, showing fantastic role models of women who changed the world. What travel and adventure books can you recommend for kids? Thanks for your tips – looks like some great reads for the kids. They’ll be great for travel and car trips to keep them entertained this summer on holidays. It’s great to travel with the family, and it will be nice to have some resources that can help them best appreciate such journeys. Hi Jane, I hope some of these suggestions came in useful for your holidays this Summer. We love books and can’t yet bring ourselves to use a kindle (but we will have to one day on our World Tour!) Thanks for visiting our blog.